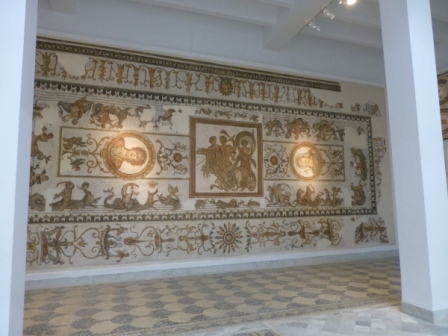 On my final day in Tunisa, I made a second visit to the Bardo Museum, the first visit having been far too brief to even scratch the surface. The Bardo is famous for housing one of the world’s finest collections of Roman mosaics so it’s a bit of a playground for mosaic enthusiasts. 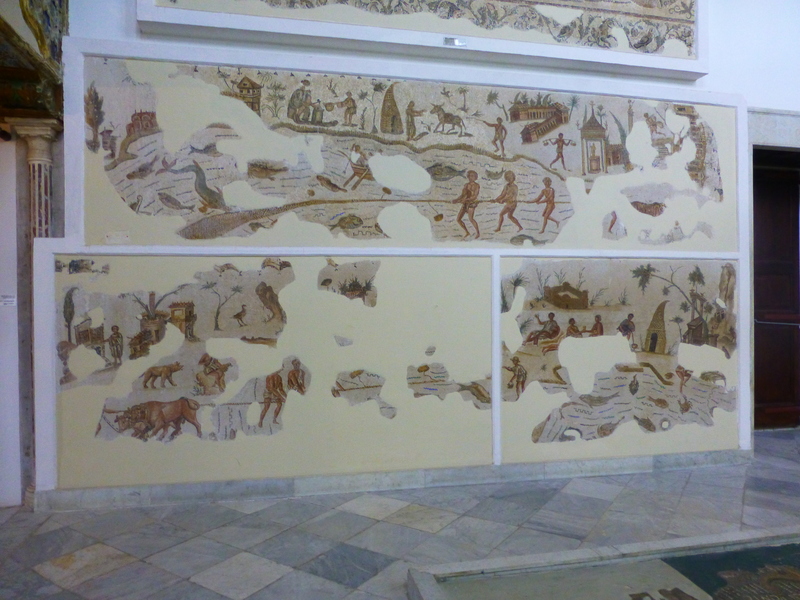 However, there was one mosaic in particular that I was on the hunt for (you do have to hunt a bit. The Bardo is a giant museum with many many secret corners). …I would be interested in such scraps. 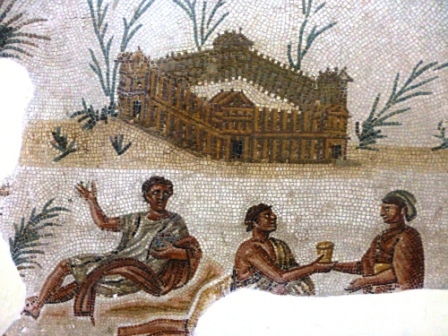 Well this mosaic, fragmentary though it is, includes some fantastic detail about lifestyles in second century Africa Proconsularis. Lets take a closer look. Here we see the large country estate with is well-appointed , fortified villa. The owner and his pals enjoying the good life afforded by all that wealth. But we also see how the other half lives. Here’s some of that wealth being created, with the hauling in of nets, harvesting the sea. and his home (temporary or permanent), the so-called African hut, or mapalia. 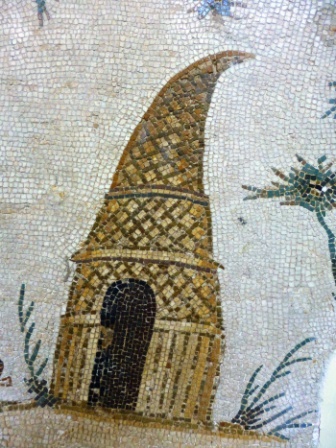 These are the huts that Virgil’s Dido demolished in order to build her new city, Carthage (Aen. 1.421) and the antithesis of the Roman lifestyle often adopted by those more enfranchised by the coming of Rome. 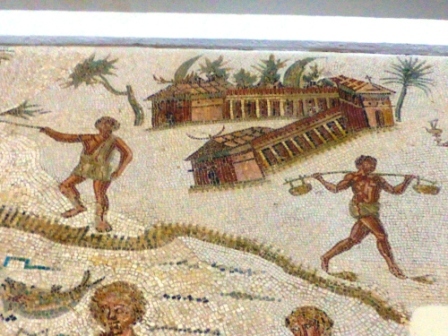 Mosaics present an often highly idealized view of life in the provinces, but they can still be good sources of evidence for how people lived, what they did with their time, the tools they used, their clothing, ways of working, and so on. 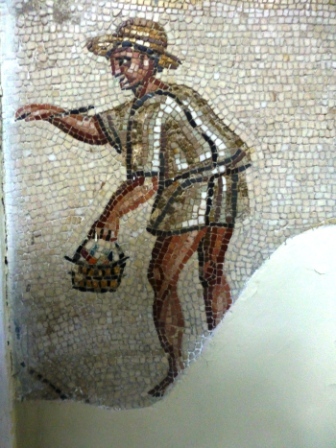 North African mosaics are particularly useful in this respect, as they often feature scenes of daily life. 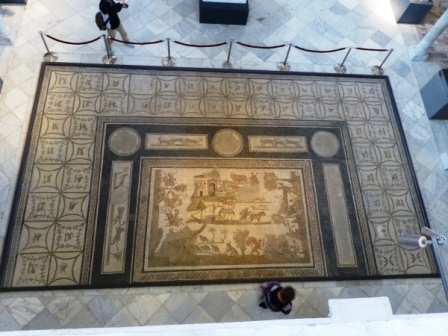 So, next time you’re looking at Roman mosaics, try for a few moments to get past the pretty pictures and the scantily clad goddesses, and down to the nitty gritty of life in the Roman Empire. I leave you with a couple of (very) scantily clad gods, just for the hell of it. 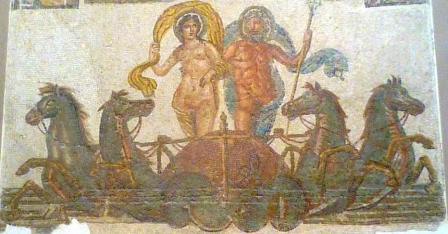 This entry was posted in Archaeology, Museums and Exhibitions, Romans, Tunisia and tagged Africa Proconsularis, Archaeology, Tunisia. Bookmark the permalink.